Come join fellow Bonny Slope Parents and Staff and volunteer at the Beaverton Clothes Closet. The Clothes Closet is operated by volunteers from the School District's parent groups and Beaverton community to provide free clothing for students in grades K-12 from families with limited income. It's a truly wonderful experience to help children and families in our own community. Shifts are for 2 hours and run from 9:15AM-4:30PM on Wednesday, Feb 20th. The ticket pre-sales are wrapping up for this year’s major fifth grade fundraiser, Pancake Breakfast, which will be held in just one week, February 2, 2019. Tickets are still available for any Bonny Slope parents, students, or community members online or at the door! Now our attention turns to filling in the staff to host this event. We need you, fifth grade parents and students. There are lots of slots that need to be filled if we are going to have this event next week! We have no parent kitchen staff at all for the 9-11 slot, and are still missing some for the 7-9 slot as well. We need students to provide customer support and act as runners to the kitchen. We are missing students for ticket tables. We need griddles! Hey, we are only borrowing them. We’ll give them back. We promise. We need parents willing to stay for a short while afterward and help clean up. The bottom line: these roles are critical to pulling off a successful event, raising money to send your child to Science School and host other fifth grade activities. Sign up for a slot today! Vision Screening is just around the corner on October 22 and we need your help! You will be a runner who shuttles kids back and forth to class and vision screening lines. You may also need to help the screeners with book keeping. Bonny Slope Volunteers! Come hang out with us and learn the ins and outs of being a Bonny Slope volunteer. Get your picture taken for your badge as well. You only need to come to one of these sessions. Tuesday, September 11th – 8:30-9:15am in the cafeteria. Tuesday, September 11th – 6:00-6:45pm in the library. Check out opportunities here and make sure to complete the background check, if you haven't already. If you're new to Bonny Slope this year or you haven't volunteered before, look at our handy dandy New Family Checklist. 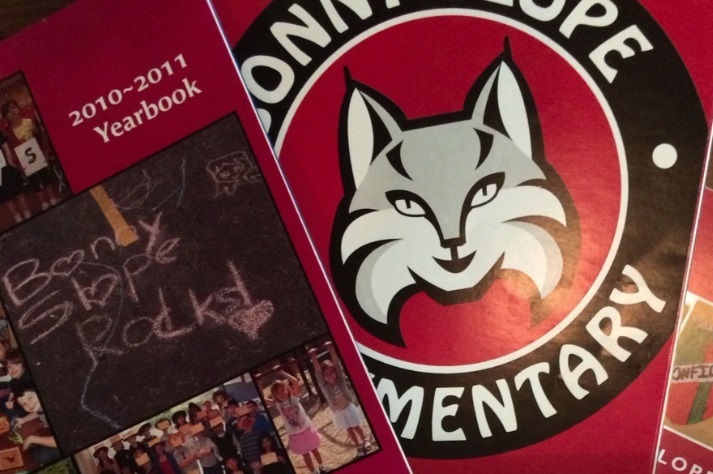 Yearbook - You and your volunteers will design, photograph, layout class pictures and edit the pages of the yearbook which is provided for purchase each June. You can recruit volunteers from each classroom to help proof their classroom page and forward any special photos of their classroom kids during the year to the yearbook committee. If you are interested, send Katie, Director of Committees, a note. She can help connect you to resources that are already in place from previous years. We appreciate every volunteer at Bonny Slope, but we’d like to give a special 'thank you' to the following parents for their committee leadership this year. BSCO Committee Leads make such an impact on our community, your efforts have not gone unnoticed. Bravo and thank you! No Monster Mash Next Year?? Volunteers Needed for a Few Programs! Please contact Katie Kammer or Holly VanderPloeg if you want to volunteer for Monster Mash or Yearbook. Contact Ellen Rothery if you would like to volunteer to be a part of the Auction.